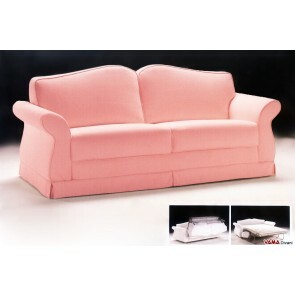 This corner sofa bed is to be considered absolutely unique. This model called Lido A, indeed, combines the comfort typical of a high quality sofa bed with a very unusual look for sofas of this kind, that is its angular structure. If you need a different size, please contact us for a free quote. Besides being perfect to be placed at any right angle, Lido A lets you recreate many interesting and stylish design solutions. 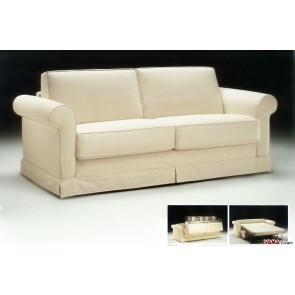 Its electro-soldered mesh keeps all the cushions integrated to its structure, allowing you to turn the sofa to sofa bed with a unique and convenient gesture. This corner sofa bed, very convenient and comfortable, proves to be perfect in both classic living rooms and in modern ones. 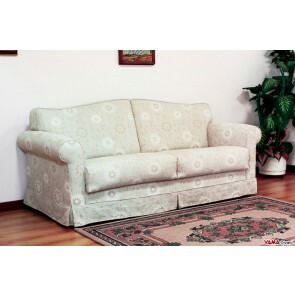 This sofa is really perfect for lovers of classic style. Duetto is a trundle sofa bed characterised by a traditional design and a sturdy and solid structure, embellished by a high back, the pleasant shape of its arms and the special cushions placed laterally and on its back. Ecomatrix is ​​a real double sofa bed: its pleasant and simple style allows you to place it with success both in classic and typically modern environments. Very comfortable and featuring a particularly strong internal structure and efficient mechanisms, Ecomatrix can be upholstered in microfibre, fabric or leather, even the thickness of its arms can be changed on the basis of our customers' space needs. 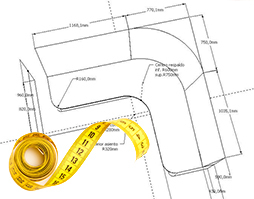 Click on the link below or contact us to choose other standard sizes or to get a free quote. 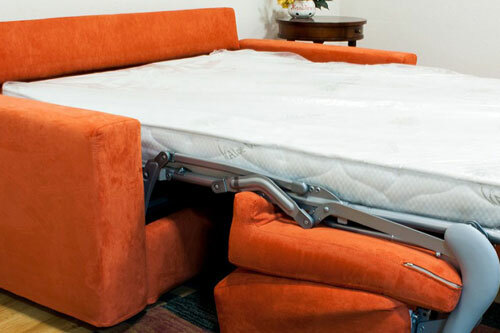 Califfa is a really unique sofa bed, thanks to the innovative click clack opening mechanism that allows you to transform it from sofa to bed with a simple push on its back. 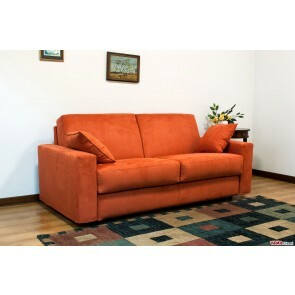 Convenient and comfortable, Califfa is a fold-down sofa bed with removable cover, therefore it is easy to clean. 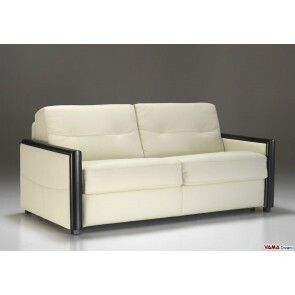 Its simple design allows you to match it in a very easy way, but at the same time, it is a quite original product. 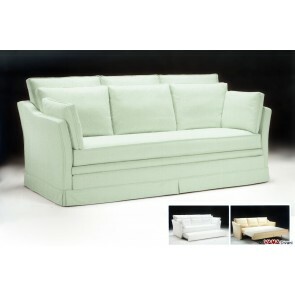 The Califfa click clack sofa bed is only available in the 3 seater version (205 cm long, as the model shown in the pictures), so it cannot be customised in any size. The design of the Galles double sofa bed is a very eye-catching one and it is really perfect for elegant and typically Vintage contexts. Its rounded arms, the shape of its high back, its front and side smooth skirt represent a lot of details that make this sofa a real gem for lovers of the classic style. 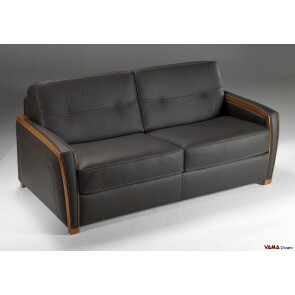 Galles can be dismantled and it comes with removable cover, therefore, it results to be comfortable both as a sofa and as a bed, this model can be also upholstered in genuine leather. 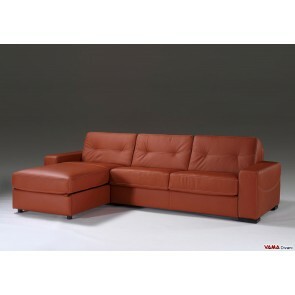 Feel free to contact us to request a quote for other sizes and models. 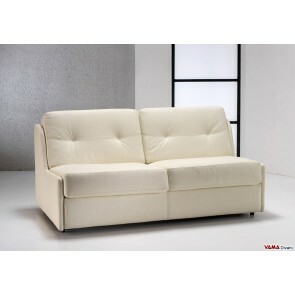 Lido A is an eye-catching even simple and easy to match modern sofa bed. Its very solid and durable structure, provides for an innovative electro-soldered mesh that keeps all the cushions perfectly integrated, thus Lido A is transformed from sofa to bed, and vice versa, with one simple gesture. 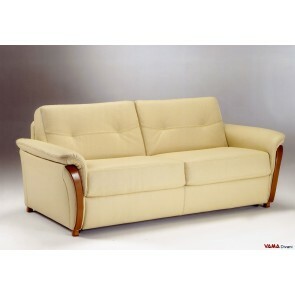 Comfort, quality and style are the key features for Lido A.
Lido E is a very refined Leather sofa bed characterised bya nice and very original classic style. 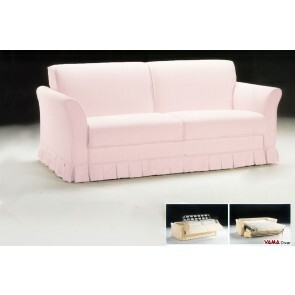 The particular shape of its arms, its thick and fluffy seat cushions, the bold wooden details in the frontal panels, are all aspects that make this sofa extremely unique and comfortable. The transition from sofa to bed, and vice versa, is very simple, thanks to the presence of an innovative electro-soldered mesh which keeps all the sofa cushions perfectly integrated during the movement. 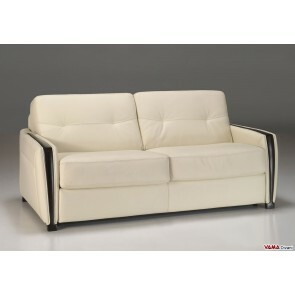 Lido G is a leather sofa bed, characterised by an original and enjoyable design, and very easy to be matched. Very comfortable, thanks to its soft and thick seat cushions and its high inclined back, this sofa is characterized by a very unusual detail: the bold wooden structures that adorn its arms. The mesh allows you to transform Lido G from sofa to bed with a simple gesture, keeping all the cushions perfectly integrated to its structure. Leather sofa bed characterised by a bold and nice style, Lido N can be placed in both purely traditional and contemporary spaces. 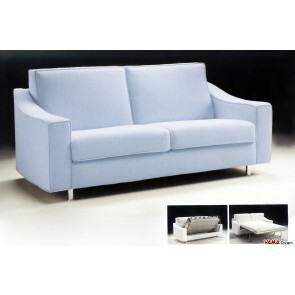 In addition to its structure, very comfortable and decorated with particularly soft padding both on its seat and on its back, Lido N is characterised by the eye-catching squared arms, and its compact look makes it a perfect sofa for smaller rooms. The transition from sofa to bed and vice versa, is particularly easy thanks to a state-of-the-art electro-soldered mesh that keeps all the cushions well integrated with the structure. The sober and stylish sofa bed, Lido C, offers a typically classic linear design, enhanced by the wooden structural elements which are well visible on its arms. Extremely comfortable, either in bed and in the sofa version, Lido C allows you to transform its structure with a simple gesture, thanks to an electro-soldered mesh that keeps all the cushions perfectly integrated. 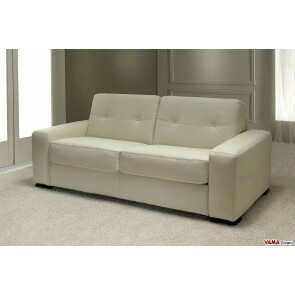 The leather used for its upholstery, a very high quality and soft material, makes Lido C a valuable sofa. Carlos is a sofa bed characterised by a bold style, which features a sober and very modern design enhanced by the special shape of its arms. Entirely upholstered in microfibre, Carlos comes with a completely removable cover, so its upholstery can be easily washed in your washing machine, like a garment. The same model shown in the picture. 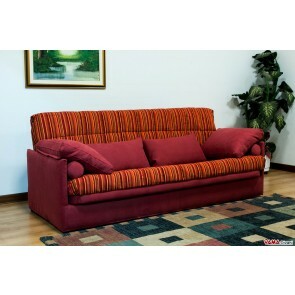 It can also be realised as a single or a double sofa bed. 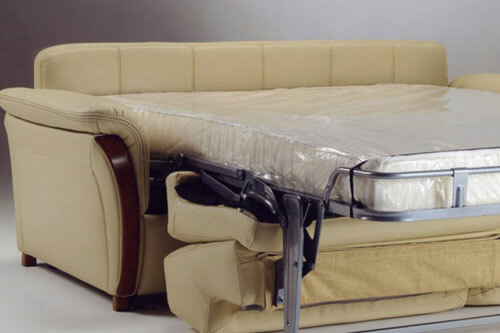 Convenient and comfortable either in its sofa version and as a bed, it is available in different standard sizes which you can view at the following link.